Older millennials are 54 percent more likely to consider buying a home in the next three years. Millennials in Texas, Illinois and Florida are most likely to consider buying (out of other large states). Millennials with a two- or four-year degree are the most likely to plan to buy (out of those without a degree or with a graduate degree). It’s no secret that homeownership is at a 30-year low, but a recent study suggests that might shift in the next few years. Apartment List surveyed 5,844 millennial renters throughout the nation on their plans for purchasing a home, and more than half say it’s going to be after 2018. 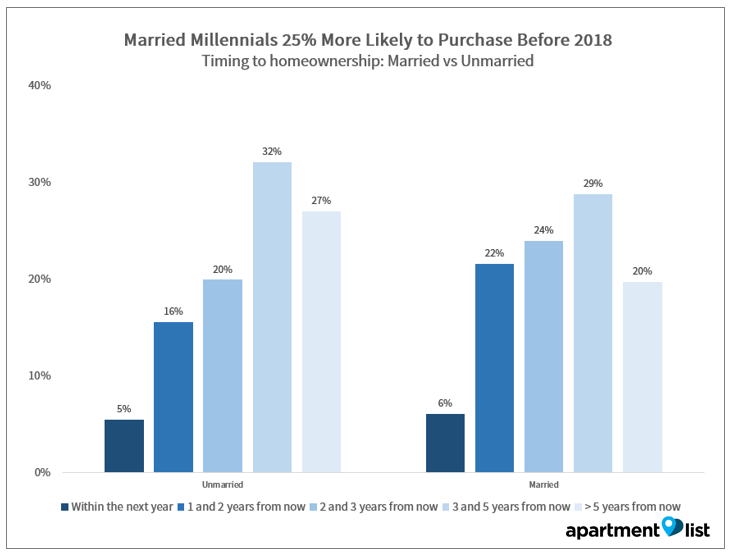 Released July 28, the study found several key components to be the drivers of millennials’ decisions to purchase or rent, and it was no surprise that age and marital status were among the most important. 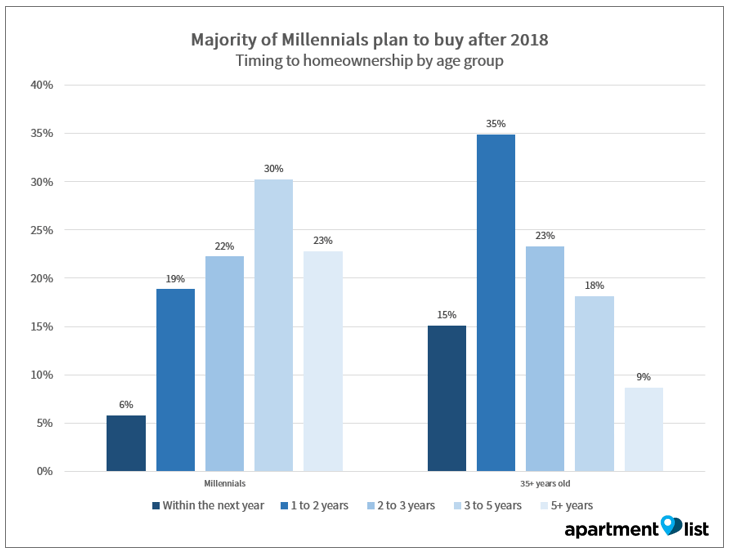 According to Andrew Woo, data scientist at Apartment List, only 34.6 percent of Americans under the age of 35 are homeowners, but about 74 percent plan to buy in the future. Within the next two years, only about 25 percent of millennial renters see themselves purchasing a home. Naturally, individuals who make up the older spectrum of the millennial generation are closer to the buying process. Of those who are between 25 and 34 years old, about 54 percent responded that they will be buying within the next three years. About 37 percent of millennials between 18 and 24 years old have the same plan. The same goes for married millennials. Those who are married are 11 percent more likely to purchase a home in the next three years than their nonmarried counterparts. Older married millennials are about twice as likely — 58 percent — as the youngest individuals in their generation to buy a home by 2018. Location plays a factor in the decision to purchase as well; in big cities like San Francisco and New York, where buying a home is incredibly expensive, much fewer millennials are planning to buy. Still, some big metro areas like Austin (82 percent), Denver (81 percent), Atlanta (81 percent) and Washington, D.C. (79 percent) had a large presence of renters who said they will buy in the near future. On a state-by-state basis, Texas ranked No. 1, with 78 percent of respondents planning to buy, followed by Illinois at 77 percent and Florida at 71 percent. The final big contributor to whether millennials are planning to buy a home is education/salary. More than 77 percent of millennial renters with a college degree plan to purchase a home, which is 10 percent more than those with a high school diploma or GED. However, millennials with graduate degrees are less willing to buy a home compared to those with a two- or four-year degree — likely a result of heftier student debt. Income had a big influence in bigger cities, especially San Francisco-Oakland-Fremont, California, and Washington, D.C.-Arlington-Alexandria, Virginia, where having an income of more than $60,000 made it much more likely for millennials to plan on buying a home.